The African continent faces challenges in the financial technology space that are diagonally opposite to the situation in the western world. With nearly 80% of adults in Africa not having access to formal or semi-formal banking services, the majority of the continent is still unbanked — at least in the traditional sense. Cash is still king across the continent, with the numbers of physical banknotes in circulation increasing up to 13% in certain African countries while there is almost no dominant financial technology player that has managed to grow beyond their home country and across the continent. The tech and investor world has been abuzz about fintech on a global level for the past few years, basically betting on fintech startups to unbundle and disrupt the bank. In 2015 alone, Investors have poured over 14 billion USD into fintech companies globally while African fintech startups have attracted almost 30% of the total VC investments into the continent, which amounts to nearly $50 million in 2015 alone, according to Disrupt Africa. 2016 has so far also been a great year for fintechs with companies such as Branch raising $9.2 million from Silicon Valley VC firm Andreessen Horowitz and Zoona crossing over $1 billion in transactions on their platform. The high number of unbanked and underserved people, together with growing economies and increasing need for financial products, represents a significant opportunity for startups to provide access to financial products and services in new and innovative ways that traditional banks can’t. It’s not just about giving access to a bank account, but mainly about creating a banking infrastructure and services for the masses that have never or rarely ever interacted with a bank before. These African fintech solutions and services will look completely different from their counterparts in the western world and will play a huge role in creating sustainable economic growth across the continent. With that said, the range of fintech startups in Africa goes way beyond just bank accounts and M-Pesa. Fintech innovation in Africa can be found across a number of different areas, crossing through all areas of life. A rough classification of the main areas of activity could look something like this, with all these services potentially building on top of each other and integrate with each other — hence the pyramid. It is not a secret that Africa is the global leader when it comes to adoption and usage of mobile wallets. The continent has over 220 million registered mobile money accounts with over 80 million active every three months. The most prominent example of a mobile wallet is Kenya’s famous M-Pesa — the posterchild of fintech innovation in Africa. Today, over 50% of adults in Kenya own a M-Pesa account and the transaction volume on the system is roughly equivalent to up to 50% of Kenya’s GDP. While Kenya has been incredibly successful with its mobile payment platform, similar programs have not taken off in other large markets such as South Africa and Nigeria. Smaller markets have seen similarly high adoption of mobile money services. For example, the South African startup Zoona which operates a similar network in Zambia and Malawi has recently announced that they have transacted over $1 billion on their platform alone. Mobile payment platforms are being touted as the main lever for financial inclusion across the continent, even though the economics of the agent model — where independent agents such as corner stores act as makeshift bank branches — still make it unprofitable for agents to process small transactions, which excludes a majority of people from using those systems to its full extent. Mobile payment platforms today are the closest thing to financial inclusion across the continent and act as the gateway service to provide customers access to a variety of financial services, but still have a long way to go to reach all the way to the bottom of the pyramid and become true platforms that make it easy to build products on top (Just look at how long it took for Safaricom to open up their M-Pesa API). So far, one of the biggest challenges for mobile money platforms is interoperability within and between countries which is putting a certain limit to their appeal as widespread payment tools. Up until recently, competing platforms, even in the same country were not interoperable and cross-border transfers were not possible or very expensive. However, a series of recent cooperation and interoperability agreementsbetween mobile operators have opened vast opportunities for cross-border and cross-wallet transactions. Today, many countries in Africa already have cross-border options for mobile money accounts according to a recent GSMA study. This is important because remittances are the biggest source of foreign investment on the African continent while at the same time it still costs more to send money to Africathan to anywhere else. The opportunity for reducing the cost of transferring money into and across Africa is indescribably big and a number of startups are working on this issue from different angles. Beyond just transferring money, new forms of remittance startups and initiatives have sprawled in the past few years. Traditional players such as M-Pesa have announced a link-up with Paypal, allowing anyone with a credit card to deposit into a M-pesa account, while startups are rethinking international money transfers from scratch. For example, value based remittance startups such as Mergims in Rwanda allow relatives abroad to purchase airtime, electricity and other goods for their family at home instead of transferring cash, where it can be hard to track what it is actually used for. Of course, Bitcoin also has the potential to become a major force in the remittance market, with both Banks as well as startups betting heavily on the new technology. African banks are embracing Bitcoin as a way to fend off disruptors while startups such as BitPesa (Kenya) and BitX (South Africa) are working on the building blocks to make affordable cross-border remittances in Africa a reality and disrupt the banks in the process. At the same time, the general population — your average citizen — still doesn’t know much about bitcoin and it is therefore not yet widely adopted, with only 2 physical shops in Kenya accepting it as of today. Lastly, accepting cash as well as digital payments at the POS is also an interesting area of development that is being tackled by a number of different startups. 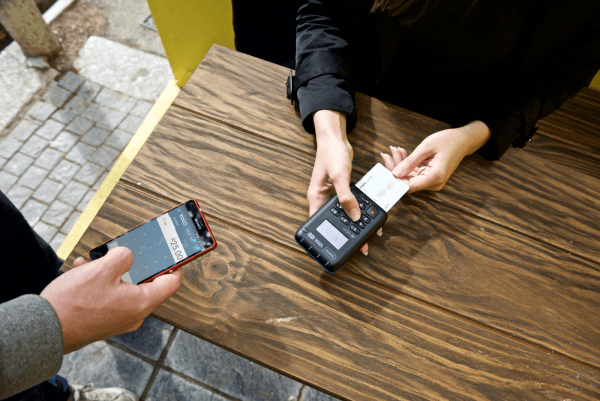 Companies like Nomanini (which grew its transaction volume by 1500% in 20 months) have built a ruggedized GSM-connected POS system targeted at informal sellers of prepaid services such as airtime and electricity, while companies such as Yoco are building portable card readers and swipe machines to allow anyone to accept card payments. All these companies have the aim of making moving money around easier and less complicated, which will in turn, play a role in driving economic activity and ultimately growth. One of the downsides of a heavily cash dependent and offline continent is that for most customers, there is no data to establish their credit worthiness in traditional ways, which makes access to financial products such as loans and credit virtually impossible for a majority of people. An exciting new wave of startups are coming up across the continent that are redefining the definition of credit scores. Using data such as phone usage, airtime consumption, social media usage, GPS logs, mobile wallet balance and many more indicators, companies like Branch and GetBucks are combining and analysing this data to calculate a customer’s credit worthiness and grant micro-loans between 2.5$ and 500$. Beyond that, companies such as Nigerian startup Bashi use driver history and ratings from the Uber platform to offer a lease-to-own product to drivers who would previously drive a car owned by someone else — earning less money and not building any wealth in the process. Thanks to products like Bashi, they can drive for Uber and come closer to actual car ownership (and therefore wealth) with every kilometer they drive. Lastly, M-Pesa itself can also act as a platform to build new banking products and services on top of it. For example, Kenyan startup M-Kopa started offering solar powered lights, radios and most recently even TV sets to customers in return for a daily payment through M-Pesa between $0.5 and $1.5 a day until the device is paid off — which usually happens in less than a year. While receiving daily payments from its customers over the course of a year, M-Kopa also learns a lot about the credit-worthiness of its customers, allowing them to offer certain products and services to its best customers specifically. Beyond being used for purchasing goods and services, M-Pesa itself has started offering M-Shwari, a dedicated savings product built on top of M-Pesa, allowing customers to save money for a specific purpose and/or timeframe. The services described above provide the first opportunity to collect financial data on people who would not have left any traces in traditional credit tracking rosters before and offer them targeted services and access to financial products which they would not have had before. Even wealth management — which as the name says needs some degree of wealth to begin with — is being reinvented and adopted specifically to the African context. Traditionally in many cultures across the continent, wealth is expressed and stored in livestock (mostly cattle). This concept is so deeply ingrained in the culture that even today, many traditional marriage rituals across the continent require the groom to pay the bride’s family in livestock before getting married. Given this tradition, it is not surprising that a number of startups are tackling wealth management and preservation in a truly African way. For example, Live Stock Wealth from South Africa allows customers to invest in cattle and get a return on their investment by selling the offspring. Users can buy a cow for ~800$ and earn ~300$ for each of the offspring that is sold, generating an ROI of almost 40%. The beauty of the solution is that it is as easy and effortless as buying stock (Live Stock Wealth manages all the buying, feeding, breeding and selling without the user needing to be involved) while trading a product that the majority of the population on the continent understands and has a deep cultural connection to. Another service that help users track and manage their finances is 22seven, which was acquired by Old Mutual recently and offers users a dashboard to track their spending and saving habits, creating more transparency and accountability in the process. Building a startup in Africa — especially in the heavily regulated fintech space — is still a daunting task. Both domestic challenges as well as a fragmented market of over 54 separate countries and over 2000 languages in Africa alone, make the process of building a pan-African company a challenge that is a few orders of magnitude bigger than anywhere else in the world — but it also makes the reward exponentially higher. This is why the key for African fintech startups to succeed is not just to raise money, but to gain access to markets and customers, which is one of the key assets that corporates can bring to the table. Pressured by competition and the need to innovate, corporates are launching a variety of programs to find, grow, invest in and collaborate with startups. Threatened by disruption from fintech companies, and the fear of being obsolete within the next decade, African Banks have been on the forefront of collaboration between startups and corporates. Over the past few years, most major banks on the continent have launched programs to collaborate, invest and acquire startups in a number of different ways and with different objectives. For example, Rand Merchant Holdings has recently launched Alphacode Club, an exclusive club for fintech entrepreneurs in South Africa with the goal of creating and supporting the next big fintech company in the Group. At the same time, Barclays opened a product lab in Kenya in late 2015 and has recently announced the 10 startups being admitted to their Cape Town based Techstars accelerator while Standard Bank launched incubator programs in both Johannesburg and Cape Town during 2015. Startups and corporations speak different languages, run at different speeds, and serve different purposes. For startups, in the beginning they are budget constrained and lack a certain power and credibility in order to land big deals and win over large client bases. Partnering with experienced industry experts helps to boost their credibility, accelerate their route to market and may lead to essential investments. For big corporations, working with pioneering agile startups brings a considerable innovation leap for them. To try and develop new and disruptive products and services themselves is an inefficient use of time and money, and looking to the broader ecosystem to partner up is a far better solution. In the coming years, these developments in the fintech space are only expected to accelerate with new startups being built to tackle all angles of financial technology across the continent and beyond and more and more banks and financial services companies joining the race to avoid extinction and growing into new markets. The ultimate goal and benchmark for the success of fintech companies will be how well they drive economic growth by creating maximum financial inclusion, high liquidity of capital within and across countries and offering customers targeted, relevant and affordable products and services that are purposely built for the African context.